When we first tested the Mundial Future, Olivier Hardwood and Elegance Cutlery we were amazed at the balance of these knives. Traditional Black 5100 Riveted Cutlery at a great price! Chef Sets and Cutlery Storage. Cool White Handle Cutlery looks great in black and white kitchens! Sushi Knives for less. 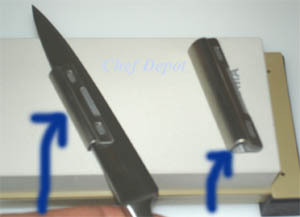 Fully forged knives are the working tools of great Chefs and the most important equipment in your kitchen. 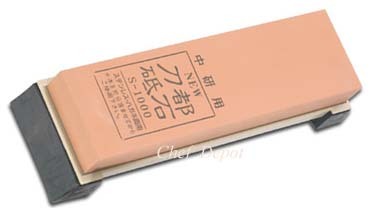 This is a diamond sharpening stone. It measures 6 inches by 2 inches and is a quarter inch thick. It has non skid rubber feet so it will not move during use! 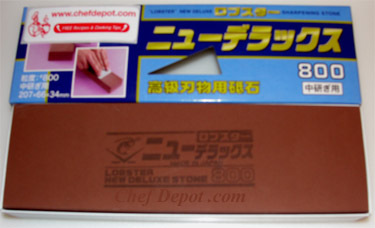 This stone will sharpen anything, quickly puts a razors edge on knives and tools! This stone is covered with a continuous mono crystalline diamond surface. This stone is perfectly flat and will stay that way forever. 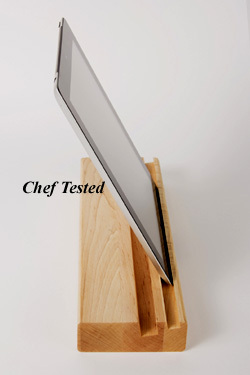 Chef Notes: We have used ours thousands of times and it keeps going! 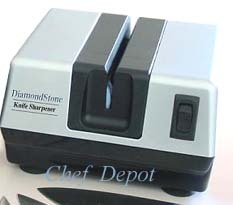 It will save you time over traditional sharpening stones. 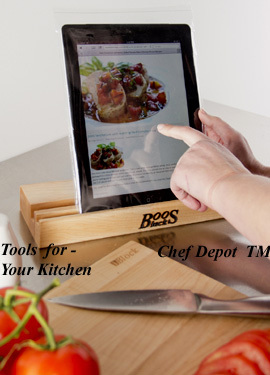 Chef Notes: A perfect gift for someone who has almost everything. 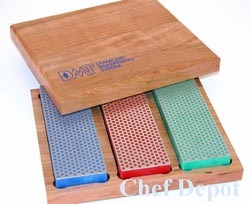 This diamond sharpening set will quickly produce a fine razor sharp edge on any good knife, garnishing tools and chisels with four six to six strokes! See the video below. 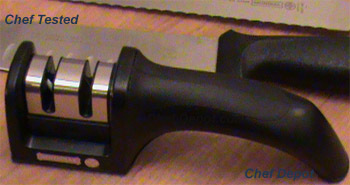 Chef is sharpening a high quality Tamahagane Chef knife. 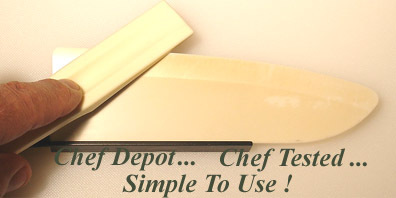 These Tamahagane Chef knives are handmade in Japan just for you! 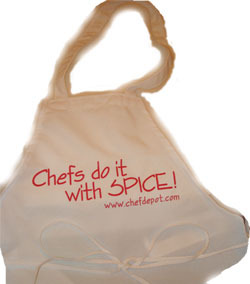 Click here for Baking Supplies and cool kitchen items! 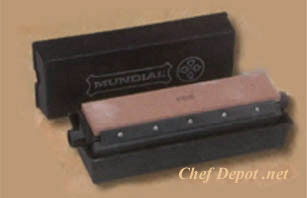 Chef is sharpening knives with a few select sharpening stones. We only sell high quality. 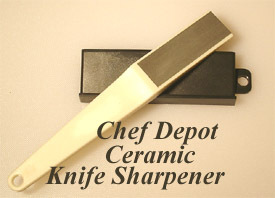 Any of the stones on this page can get your knives sharper, folling the steps can get them sharper than the factory edge. 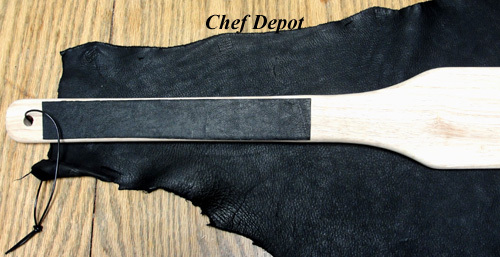 The leather strop below will help you put a nice polishing finish on your knives. 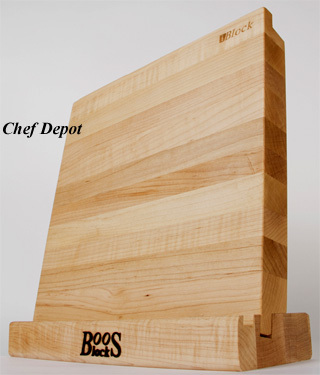 Chef is using one of his favorite Maple Cutting Boards, click here. Made in USA.Order the knife clips are above! Chef Notes: So you are feeling lazy, OK, we get it. 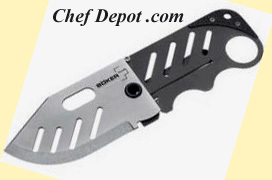 A great choice for kitchen cutlery and pocket knives! 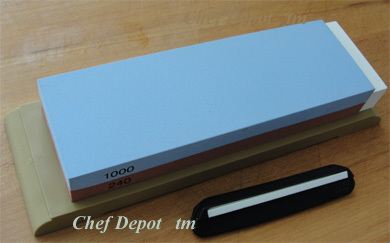 This 10 inch diamond oval sharpening steel is the choice of more butchers! 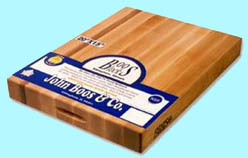 It has a 10 inch long oval steel that allows for quickly returning the edge to any knife blade. 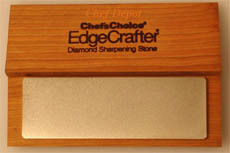 This diamond steel will quickly produce an edge on any good knife with six to ten strokes. 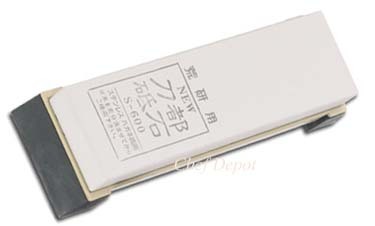 Sanitary black plastic handle is non slip. 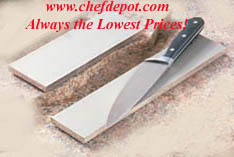 Click Here for more sharpening steels! Click here for pocket knives!